I recently had a trip to Columbus Ohio staying at the Embassy Suites in Dublin. 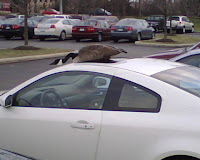 This morning when I can out to get in my rental car I found a goose sitting on top of my car. I couldn't get in the car to go to my appointment until I got the goose off and after negotiating with him for about 15 minutes I decided that the best way to get him off the roof was bribery. I went back into the hotel and got a biscuit from the breakfast buffet and went back out to the car. Finally the goose came off the car when I waved the biscuit around, although he chased me through the parking lot for a few minutes. I took a picture of him with my phone cam. Every trip is unique and usually has a good story but this is a first for me, the goose who carjacked me.